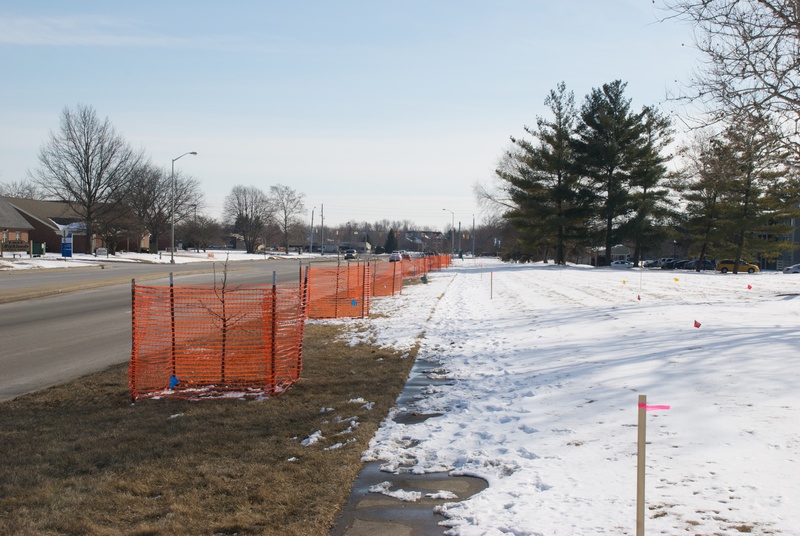 Construction has begun on what DPW is calling the North Segment of the Eagle Creek Greenway extension project. For background, the greenway currently consists of two very separate pieces: one that winds through the Pike Youth Soccer Complex at 56th Street and Reed Road just south of Eagle Creek Park, and another at the opposite end along Raymond Street between Eagle Creek and the White River. This extension project is broken up into four segments that will connect those two existing stretches. The first scheduled segment of the four is the North Segment, which runs along Eagle Creek Parkway from just north of 46th Street to 38th Street, then turns West along 38th Street past the Eagle Creek Air Park and south along Dandy Trail—over I-74—to the north side of Eagle Creek. It is a 2.3-mile-long segment. 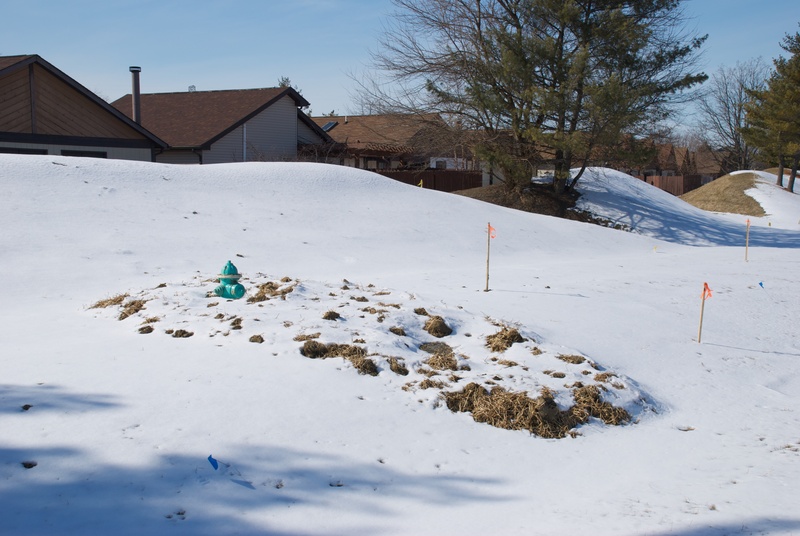 As of now, underground utilities have been marked, and the route has been laid out with stakes. Several trees have been surrounded with protective fencing, and the clearing of the right-of-way is expected to begin next week. Construction will move forward as weather permits, and the segment is scheduled to be complete sometime in the Fall. This project has the potential to be pretty exciting for this part of the city, and I’ve personally been waiting a long time for it to get underway. It borders on a lot of large apartment complexes, housing additions, and the only major commercial node in the area. Unfortunately, without at least a few crosswalks, I’m not sure the full potential of the trail can be realized. I already mentioned the obvious need for a proper set of crosswalks at Eagle Creek Parkway and 38th Street, but the lack of crossings doesn’t end there. 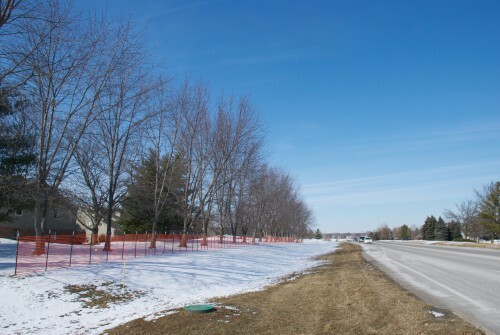 Originally, the project plan called for going around the West side of the Air Park along Dandy Trail. 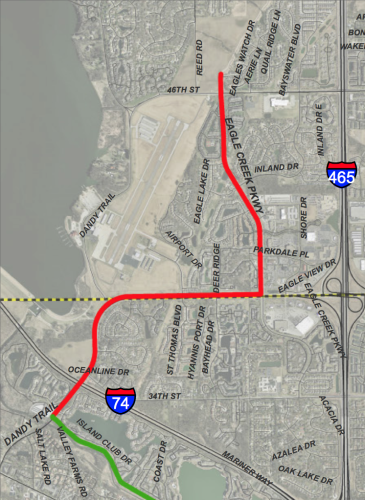 One of the reasons for changing the route was connecting to Eagle Highlands Park, which is east of Eagle Creek Parkway on Inland Drive. It would be great for all residents of that neighborhood if there was a way for pedestrians to cross Eagle Creek Parkway at Inland Drive, whether that was a stoplight with walk button or—at least—a flashing yellow light. 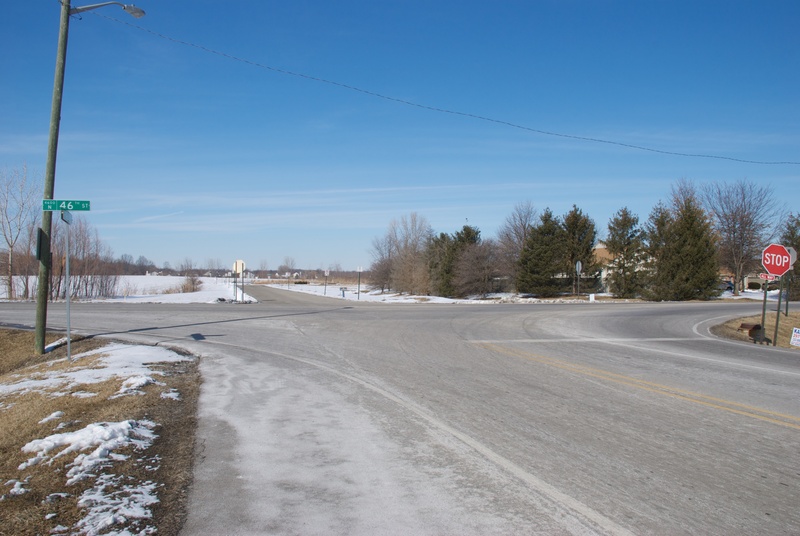 There are currently no signalized crossings between 38th and 46th Streets on Eagle Creek Parkway. Second, there needs to be a way to cross 38th Street anywhere along this route. 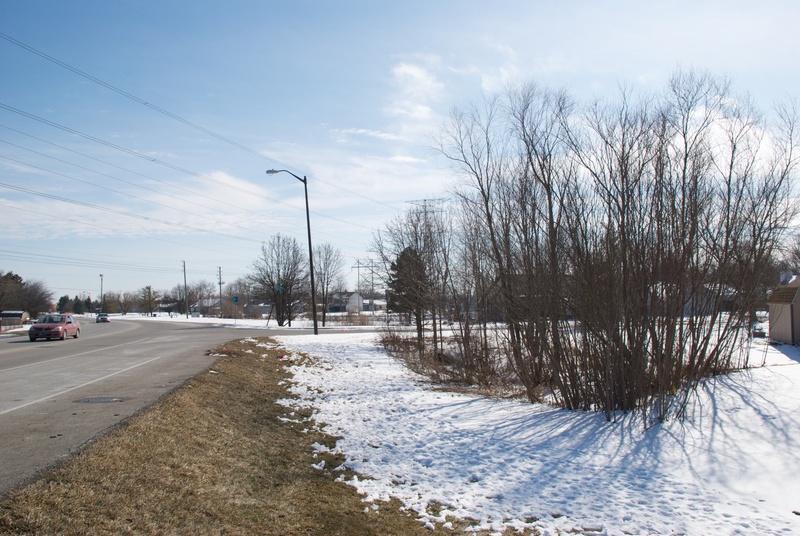 Right now, there are no signalized crosswalks anywhere west of I-465, and no one who lives on the South side of 38th Street can get to this trail without crossing four lanes of traffic in a 40-mph zone. Once the snow melts and more things start happening, I’ll provide more updates. Great information, Scott. Thanks so much for sharing it. Thanks so much for this update! I’ve been trying to get updates on the greenway construction projects for so long. Keep them coming. And if you have anything on Pogues Run that would be appreciated too. Pogue’s Run Trail is at 50% of phase I design. The first leg will run from the Monon at 10th St, to the west/southwest tip of Spades Park. The northernmost lane of 10th Street will be taken out to allow for a 10-foot asphalt trail with 2′-3′ buffer. The trail will cross Brookside, then turn north along the eastern edge of Brookside Ave, again, removing a lane of traffic for a 10-foot asphalt trail and 5′-6′ tree lawn. The width of the buffer will vary slightly along Flethcer Park to accommodate existing trees and a pathway. At Newman, the trail will turn east and be located within existing greenspace along Pogues Run to it’s first phase terminus at Commerce. I will work on providing updated details. Do you by chance know the estimated start and completion months (assuming no unforseen issues) for this segment of Pogues Run or the Pennsy Trail Phase II? Pogues Run should see utility work and beginning phases later this spring. I’m not certain about the Pennsy. Phase 2 should be starting any day now. Thanks again Joe. I love seeing these greenways being extended and connecting! Glad to hear this update. I had been waiting for this extension to start construction since moving back to Indy. This would give me more options to run/bike from Eagle Creek to other connecting greenways around downtown. Exciting news indeed. Too bad they changed the plan for the greenway from Dandy Trail/West Air Park to Eagle Creek Parkway. It’ll be even more of a scenic run/bike during sunset with the backdrop of the airport on this route in my opinion. You are right though, they definitely need crosswalks and/or better signals on 46th St. and West 38th. I ran and biked on these streets numerous times and these cars just don’t care for us runners and bikers. The same goes for 56th going toward Browsburg after crossing the bridge. There isn’t any bike lane or sidewalk and the car drivers always go at least 45+ MPH. Hopefully one day this will change with new sidewalk and and bike lane. 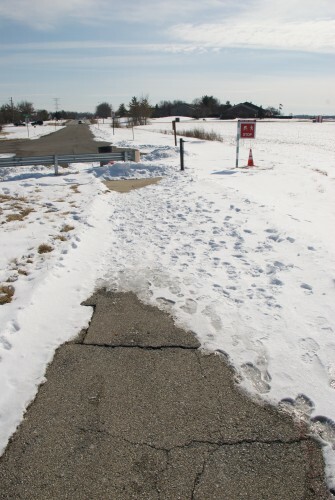 It’s a shame people on the other side of Eagle Creek can’t access the park and greenway on foot or bicycles without having a feeling they could get run over. I know I had on several occasions. I live on the east side of West 38th and 465 and it’s chore to even run and bike to the greenway and Eagle Creek Park. People around Indy tend to downgrade this part of town but I always love it here; with Eagle Creek Park and the new greenway extension, it’s making living here around even more worthwhile. Please keep us posted if you have any new info about the extension. 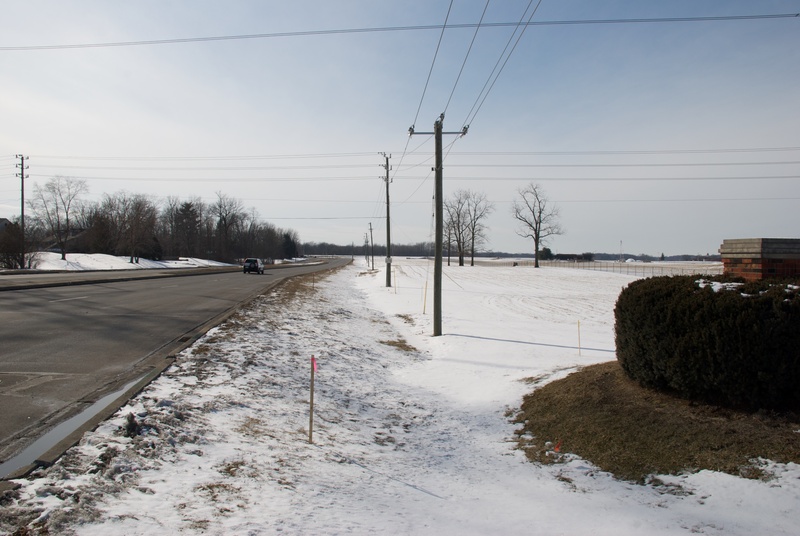 While I do agree the scenic route on the edge of Eagle Creek Reservoir would be wonderful, the change along Eagle Creek Parkway makes sense in that the trail would have access to the apartments and homes along there. So many people would find it easy to use the trail since it is right in front of them. Perhaps one day a spur along the water could be built and connect back to the trail. That would be the best of both worlds. That is a good point regarding the trails within the apartments and homes around Eagle Creek Parkway. This will encourage and motivate the residents around the area to be more active…something I believe this and many other cities are in need of. I always hear the local government wants to encourage their citizens to be more active and living a healthy lifestyle, but in the contrary, there isn’t much trails and/or even sidewalks for people to do that. 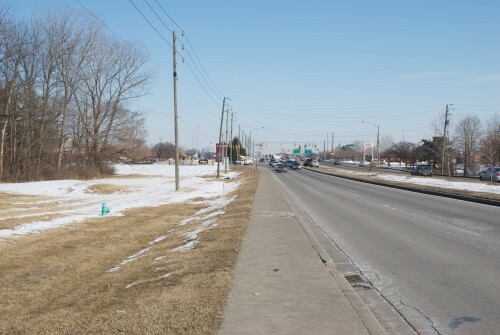 Take the the northwest side for example, there isn’t that much sidewalks and bike lanes to begin with. West 38th Street was reconstructed a few years back, but there wasn’t any bike lane made for it; at least they made the sidewalks on both sides. A splendid idea for a spur along the water. This reminds me of Portland, Oregon, they have many of these spurs along their rivers for people to walk and exercise. Make for a beautiful scenic view to boot. 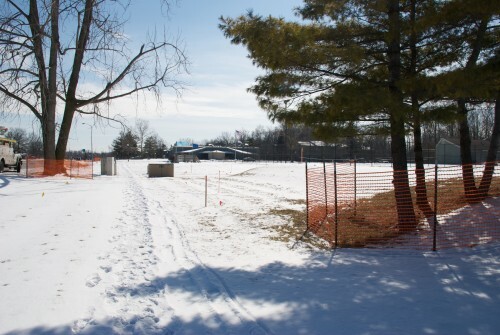 Are there any plans for further development/construction of Eagle Creek Trail along west 71st street? Thank you. I want to to thank you for this site (twitter.com) wonderful read!! Some manufacturers will tell you to choose bulbs by how much electricity you se. energy efficient than the conventional lights. One can find them installed at night clubs, shopping malls and various entertainment venues. Update: Eagle Creek trail construction is in full swing. Last week I saw the section between 46th and 38th St were ready for asphalt. And as of Monday I saw (on Facebook) that some sections have asphalt laid already. The section just north of Raymond/Kentucky had been excavated as of last week and this morning I saw work being done just north of I-70. In other greenway news: The Pennsy connector from Pleasant Run (at Ellenberger Park) to the previous start of the Pennsy (Arlington/Bonna) should be ready for asphalt to be laid very soon. Any updates on Pogues Run or the protected bike lanes (New York, Michigan, Delaware)? I can confirm that the southern portion from Kentucky/Belmont to the railroad bridge just north of I-70 is in various stages of excavation. I’ve been riding the levees for a year and was pleasantly surprised to see the work so far. And as long as you’re not running skinny tires, it’s ridable now. I’m curious as to how they will negotiate under that railroad bridge. Based on the map, it looks like there will be a new multiuse bridge built just past the railroad and this follow the streets past the salvage yard back to the levees. I live nearby and I’ve been watching the construction of the Eagle Creek Trail extension since the beginning. 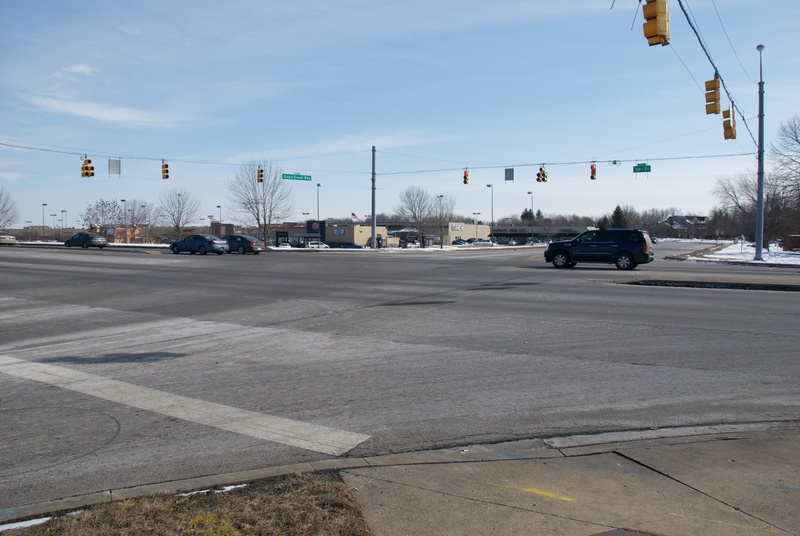 Apparently, a positive change in plans was made, as a crosswalk signal with push-buttons has been installed at 38th and Eagle Creek Parkway. Distance markers have also been installed and the last of the concrete has been poured at the two or three final . I’ve already enjoyed many miles of trail usage and really appreciate this project finally becoming a reality. Todd – Can you confirm what sections of asphalt has been laid? This project is nearly complete. They have one or two small sections of concrete to pour, and a little bit of finishing work to do (dirt filling, grass planting, some fence rails, maybe painting some crosswalks). The entire stretch is 100% walkable, and will be bikeable very soon. They did add crosswalks at 38th and Eagle Creek Parkway on the west and north crossings (which is great). However, it doesn’t appear there will be signals on the south or east sides, so you’ll still have to play frogger to get to Marsh or Target. The distance markers they installed don’t match the old distance markers. Both directions count up from 14.5… I’m not sure if that’s a mistake or if they are going to replace the old markers and decided to reverse the miles. The signs are very nice though. There are a few other little finishes I’d like for them to add, but overall, the project looks really nice. I have heard some rumors that the middle two sections are going to be delayed indefinitely pending funding, because the two sections that are finishing up now both went significantly over budget. I haven’t seen any official confirmation of that yet though. by surprise – especially if you are coming to it off the back of previous DICE titles like Battlefield: Bad Company 2. Counter MVP – Kill the #1 player on the enemy team ten times in a single match. I am confused – what is the trail mileage marker numbers mean? The numbers are larger as you move South along the trail – is this correct? can someone tell me where I can find a access point for the south end of the greenway.